3rd-strike.com | FINAL FANTASY XV POCKET EDITION Now on Switch! 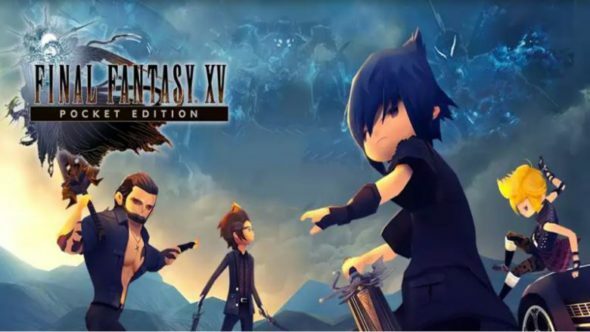 FINAL FANTASY XV POCKET EDITION Now on Switch! The remastered Final Fantasy XV experience, with the distinct cutesy look and accessible control scheme, is now available for the Nintendo Switch. This after the Xbox One and PS4 release last week. The accessible re-imagining of the much beloved Final Fantasy XV originally made its way to iOS, Android and even Windows 10 devices, and sold more than 8.1 million copies worldwide. For the console version of this title the user interface got redesigned for consoles. To celebrate its launch, players that buy the game between now and the 20th of September get a 40% discount. In the title, players both new and veteran take the trip with Noctis, and his friends Prompto, Ignis and Gladiolus, which includes voice acting, and faithfully recreated battles. All special moments of FF XV, like riding with the Regalia through beautiful landscapes, camping, riding chocobos and more, which are all present for this HD-console version.